John Sandoe founded the shop in 1957: according to a customer who knew the shop in its infancy, it began with three planks laid on bricks on which were laid out “all the books one could ever hope to find in one place”. More books and more shelves followed, more floors and an expanding shop front too, but the original ethos remains the same. Sandoe’s today is a general book shop with a bias towards the humanities – fiction, history, biography, poetry, art, architecture, decorative arts, music, theatre, cinema, photography, fashion, natural history, gardening, travel, cookery, science, reference, and an excellent children’s department. We are on three floors of three adjoining – and small – eighteenth century shops, with gorgeous window boxes spilling down from the first floor. Books are crammed in everywhere, piled on tables and even on the stairs. No surface escapes its burden, except a few chairs and window seats. The somewhat old-fashioned and picturesque appearance is finely balanced with 21st century digital technology. As well as regular local customers and visitors from abroad, we have a loyal clientele in the United Kingdom, Europe and around the world who receive our quarterly lists of recommended new titles. (See Browse Catalogues) We also have lively programme of events – talks by authors and book launches. (See Events) We have 5 full-time and 5 part-time staff to serve our customers. Orders may be placed by telephone or email, or via the website. We will try to find any book, even if out of print. Every year since 1995 the Cuckoo Press, on behalf of John Sandoe Books, publishes a short work, usually in paperback, to be given away or sold to customers in the run-up to Christmas. These commissioned pieces are mostly short stories but have also included first chapters of novels, collections of poetry, memoirs and even photographs of icebergs. A number have been produced by staff members (including John de Falbe, who set up the Cuckoo Press, Marzena Pogorzaly and Stewart Grimshaw) and we have had several contributions by writers who are also customers. We are proud to be able to name as contributors (in no particular order) Javier Marias, Dame Muriel Spark, Philip Hensher, William Boyd, Juliet Nicolson, Salley Vickers, Adam Thorpe, David Abbott, Julian Mitchell, Arabella Boxer, Richard Bassett and Edna O’Brien. 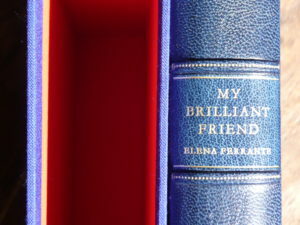 The most substantial Cuckoo Press publication to date has been our special, limited and signed edition of ‘My Brilliant Friend’, being the first of Elena Ferrante’s remarkable Neapolitan Quartet, published in 2015. We feel extremely honoured to have been allowed to do this by the Italian author and Edizione E/O, her publishers. (See here for more details: My Brilliant Friend). We had huge fun designing the book, and working with Nicky of Black Fox Bindery was a joy and a revelation. This edition has now sold out in both formats. We are often asked what happened at 10-11 Blacklands Terrace before John Sandoe’s arrival. According to Dirk Bogarde, no 10 was ‘a seedy little tobacconist’ before the war. The shop was said by John to have been occupied during the war by ‘a man who sold antiquities to Popes and people in those big hats’ – although why Popes and people in huge, flaunting bonnets should have congregated in Blacklands Terrace in those days sadly remains a mystery. Downstairs was ‘a poodle parlour’, the charmingly named ‘Chloe of Chelsea’, and upstairs (our paperback room) was a secretarial agency. No 11 was a dress shop: our stock room still had the mirror on the wall until 2014. Soon after the war, Tom and Ros Chatto took over the ground floor of no 10 as a secondhand bookshop. The Chattos’ neighbour at no 12 was a vet, Anthony O’Neill. He looked after Churchill’s dogs, and he was there until 2013. John Sandoe opened the shop on November 11th, 1957. His intention, which remains a fair description of what we still try to do, was to offer his selection of the best current books and to obtain any other books he might be asked for. His grandmother was shocked because he did not have blinds to pull down over the windows on Sundays. From the outset, he had a colleague, Felicité Gwynn, who was Elizabeth David’s sister. Felicité was remembered for many years for her contempt of those she regarded as fools as well as her formative influence on their reading. ‘She loved selling books and was liable to throw them at people on occasion in exasperation,’ said John. ‘But they would apologise to her, not her to them.’ She left in 1984. John died in 2007, but he had retired from the bookshop because of ill health in 1989, selling it to Stewart Grimshaw, and to John (‘Seán’) Wyse Jackson and Johnny de Falbe, who had worked for John since 1979 and 1986 respectively. Seán left in 2003 to return to Ireland, four years after Dan Fenton had become a partner (he began working for Sandoe’s in 1992). Dan left in 2015. We have about 30,000 books here, of which almost all are single copies. We would like to thank James Campbell for his kind permission to use his artwork on this website; also to Marzena Pogorzaly and Arabella von Friesen for their photographs; and to Ben John for his drawing. Copyright is retained in all cases by the artist. Our grateful thanks too to Ilya Levantis for his help in building the site. John Sandoe is an integral part of my life in London. It is quite simply the best bookshop anyone could wish for. You’ll find plentiful prize bats in this glorious belfry! A recent “find” is John Sandoe, a three-floor independent bookshop crammed with fiction, biography and coffee-table tomes on absolutely everything; I could spend hours there.